Stonehaven Ladies are through to the SWFL Division 2 Cup semi-finals after a hard-fought quarter-final win at Bishopton last Sunday. The battle of Erskine Bridge will live long in the memory of supporters of the victorious northerners, who through sheer discipline and effort survived a late onslaught, having dominated the majority of the early exchanges. Stoney started at a high tempo with Bishopton affording them a lot of respect with a more defensive 4-5-1 line-up, inviting Stoney onto them. With Bishopton’s pace on the counter attack their plan was obvious but they had to get the ball first and Stoney gave them precious little for the first 20 minutes. Stoney’s first sighter on goal came after Smith slipped Townsend through in the inside-left channel and her shot from a narrow angle slipped agonisingly wide of the right- hand post. The compliment was returned with Townsend slipping Smith through inside the toiling full back, and as she homed in on goal she slipped a ball across the six- yard box that was cleared. Livewire striker Urquhart was setting the tempo with her non-stop movement and the sight of her charging into a challenge against a defender six inches taller than her typified Stoney’s attitude. Townsend then rolled her defender from a throw-in and dinked the ball in to Smith, who swivelled past the last defender but slid the shot agonisingly past both keeper and goal. Stoney’s midfield had a stranglehold of the game with full backs Caira and Grundy impressively winning 50/50s and Milne using her controlled aggression and knowhow to shield the back four. Penny came close from a corner but the ball wouldn’t quite fall for her then Townsend headed narrowly over at the back post. The goal finally arrived as Smith cut inside her full back and drilled the ball hard and low. Her shot was expertly tipped away by the keeper but only into the stride of Urquhart, who was never missing, and it was 1-0. Bishopton then started to show their prowess with their skilful centre forward having to be expertly shepherded by Penny with the extra insurance of skipper Bradley’s pace limiting the damage she could have caused. 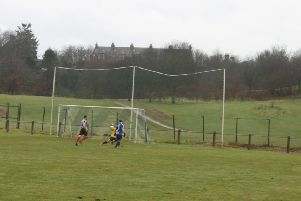 Bishopton’s other possible route back into the game was from their well-worked set plays and only alert keeping by Imray from a shot in a scramble prevented an equaliser. The second half started more evenly. The impressive Milne and Sykes went off as the tricky Masson and commanding presence of Campbell entered the fray. The game got scrappier with nerves setting in. Smith crossed low for Masson only for the onrushing keeper to wonderfully half-block her shot as the ball was hacked clear. Masson slipped her markers to go one on one but again the keeper excelled with the block. At the other end both Smith and Urquhart were well positioned to clear off the line from set plays as Bishopton became more desperate, committing more players forward but allowing Stoney to pick them off on the break. Caira chested down a ball cleared from a Stoney corner to return the ball with interest and it flew narrowly past the postage-stamp corner. Then Penny’s gleaming boots lofted an audacious 30-yard chip inches over the bar.